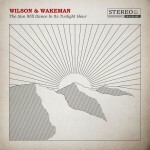 Share the post "Album review: WILSON & WAKEMAN – The Sun Will Dance In Its Twilight Hour"
Wilson & Wakeman – Damian Wilson on vocals and acoustic guitar and Adam Wakeman on piano, vocals and acoustic guitar – are back with a new album. They work well as a duo in the live environment as their live shows are always well received and reviewed, plus of course they are both in progressive rockers Headspace. Alongside the duo the album features guest musicians Andy Dunlop (Travis) on guitar, Ash Soan (Adele, Robbie Williams) on drums, Tony Woollard on cello and Hayley Sanderson (Strictly Come Dancing) on backing vocals. They are the masters of packing lots of melody into a song without going overboard on the music. The vocals of Damian Wilson and piano playing of Adam Wakeman, along with both on acoustic guitars, are the key elements on each song, whether it is the glorious melodic pop of ‘The Last American Hero’ or ‘Better Than That’ – check out the rip roaring piano solo on this one and Hayley Sanderson’s backing vocals on the outro. An early runner for song title of the year award goes to ‘Blackpool Clip Joint Racket’, a jolly little ditty about the seaside psychics. Wilson’s vocals and Wakeman’s piano again work perfectly together. ‘Red Socks’ is a tender song relating how a childhood memory of losing a treasured pair of red socks can still echo down the years. This entry was posted in ALBUM REVIEWS, ALBUM REVIEWS (Mobile), All Posts and tagged Adam Wakeman, album, Damian Wilson, melodic, Ozzy, pop, progressive, review, rock, Snakecharmer, The Sun Will Dance In Its Twilight Hour, Threshold, Wilson & Wakeman. Bookmark the permalink.